Refillable cartridges for Brother LC-229 BK, LC-225 with auto reset chip. Simple and clever! 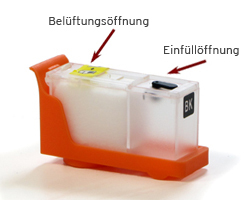 Refillable cartridges for Brother LC-123, 125, 127 with autoreset chip. Simple and clever! This ink refill kit includes refillable ink cartridges, an illustrated instruction and all tools needed for refilling your cartridges. 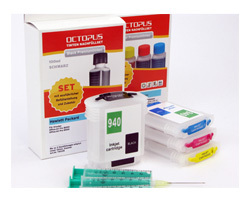 Refillable cartridges for Primera LX 900, a cost-effective alternative. Incl. single-use chips.